Helen Chizu Iwanaga formed bands of all types in the internment camps during World War II, welcoming the new prisoners with big band arrangements of swing tunes like “Moonlight Serenade”, “I’m In the Mood for Love,"It Had to be You” and other jazz standards. In the course of my research I brought her name up with people from several different backgrounds from the Watsonville area, and they invariably got a big smile on their face and sank into fond memories. She served as piano teacher and friend to so many that she was beloved by all the parts of her community. One of the first Asian American graduates of The College of Pacific (now UOP) Music program, Iwanaga was a pioneer in Buddhist music. “I love to sing, I go to the opera, I love symphonic music!” exclaimed an energetic, youthful, Helen Iwanaga in her mid-80s. She passed away in 2007 at the age of 92. This first photo was taken in the Poston internment camp during WWII. Their daughter-in-law Reiko Iwanaga says, "We've heard that they were able to leave Poston to go to another camp for the funeral of her mother. My husband remembered that the train made a stop in Texas and it was after the 442 had rescued the Texas Battalion so they were treated nicely. We thought the photo reflected that time when they traveled probably by truck to the train station. I may be wrong but that is what we were told." Photo taken just months before these Americans were imprisoned in the internment camps during WWII. They would re-create these bands in the camps. Buddhist Ceremony - Mrs. Iwanaga's husband was an extremely respected Minister for his work in, among other things, Bon Odori. Mrs. Iwanaga was a partner in his work. Minister Iwanaga headed the Buddhist Temple in Watsonville, and was active throughout California and the world both before and during his tenure there. [George Yoshida] always told us the Nisei bands in the camps would get charts [of tunes like “Tuxedo Junction” and “In a Sentimental Mood”], and they got one for “Don't Fence Me In.” When they got the recording, they pointed the speakers towards the guardhouses, so it was like the spirituals: there's already an implicit message. To show that irony—the hypocrisy. “We're Americans; we listen to American music, yet you've got us here in these camps." Seventy years later, we now know it was a triumph of the human spirit. In 1920s Japanese government decided the way to present music to Japanese students was through European music “because, 1) European music could be written down in a standard notation system, whereas Japanese music at that time could not, and 2) the majority of Japanese traditional songs that were popular at that time dealt with “deep love affairs and were fill of risqué language, and therefore not appropriate for primary education.…[This] resulted in the evolution of a new Japanese music written in a Western European musical style. The majority of songs were written in a western European style by Japanese traditional musicians who studied some western music. However, the original lyrics were replaced by lyrics written by poets and scholars of classical Japanese literature…"
Doyo are children’s songs first written during the Taisho Period (1912–1926) in a western song style by Japanese musicians and poets. This created a big demand for pianos which led to the creation of the Japanese piano and organ industry. Jazz had been a part of the Japanese cultural scene for nearly a quarter of a century before the postwar inundation of GI musicians and fans that produced indigenous counterparts such as pianist Toshiko Akiyoshi, alto saxophonist Sadao Watanabe, clarinetist Eiji Kitamura, and saxophonist Hidehiko "Sleepy" Matsumoto. The latter, when he performed at the Monterey Jazz Festival in 1963, the first Japanese artist to appear there (playing baritone sax alongside Gerry Mulligan no less), prompted an ordinarily enlightened critic, Ralph Gleason (who should have known better), to regard him as a novelty, "interesting only as a curiosity." But jazz was no longer just a curiosity, a novelty, to the Japanese. 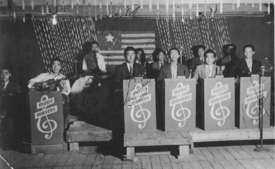 Purportedly, jazz arrived in Japan as early as 1921, when a young man named Shigeya Kikuchi, serving as secretary to his father on a U.S. business trip, returned to his native country with a load of Dixieland 78s. Japan's own "Roaring Twenties" were inaugurated by the Great Earthquake of 1923—which devastated Tokyo, the city burning for forty hours but, as Edward Seidensticker has written, reconstruction, in typical Japanese fashion, having begun "before the last embers were out." [Masahisa Segawa] would tell me that Shigeyo Kekuchi was probably not the only person to return from the States in 1921 with jazz in hand. "Around that time," [Masahisa] Segawa said, "several persons took jazz recordings, sheet music, or any information about jazz and brought them back to Japan; so these along with many dance records were already available.…"
Segawa also felt that there had been considerable jazz activity before the 1923 earthquake: "Already in Tokyo and Osaka—particularly in Osaka—there were many dance halls. I mean ballrooms. So already there were many Japanese bands playing dance music—very primitive dance music. Many Japanese were dancing at that time. Many music sheets [Segawa used this phrase, and I liked it! ] had been introduced, so they were playing these tunes." By 1935, Nisei singers had come to Japan, along with many Filipino musicians, among whom the Conde brothers were best known. Masahisa Segawa told me that clarinetist Raymond Conde is still playing actively. 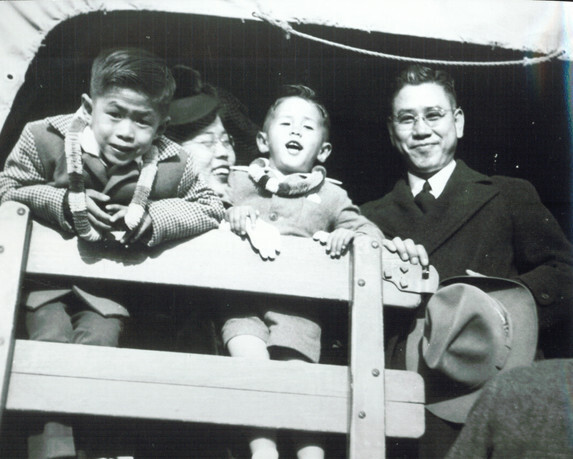 "There were four Conde brothers," he said, "and two—Raymond and Billy—stayed in Japan. They married Japanese ladies and they have families, and they have Japanese nationality." Two Filipino musicians, Francis Kokiko and clarinetist Conde, became the core of the most popular combo after the war: the Gay Septet. And out of the Gay Septet came such current players as drummer George Kawaguchi and tenor saxophonist Hidehiko "Sleepy" Matsumoto. "Those Filipino musicians taught them," Segawa said. Minister Yoshio Iwanaga, a Buddhist missionary reverend, dance teacher and chorographer came to the United States in 1930 to teach Doyo Buyo and bon odori to the Nisei members of the Buddhist Mission of North America. He taught and produced children’s dance recitals for twenty years at Buddhist temples throughout California, Oregon, Washington and Western Canada, He also expanded the Japanese American observance of Obon in California to include bon odori, the dance component of Obon in Japan which had rarely been performed on the Pacific Coast of the United States before Reverend Iwanaga’s arrival. [Minister Iwanaga] majored in Spanish at Tokyo Trade Language School.…[He] listened to Bach, Beethoven and Mozart and was educated in Japanese theatre, pottery and ikebana (flowers). Mrs. Helen Iwanaga was “his first vocal and piano accompanist…” Five years after their first meeting they were married and they were later named the first heads of the Music Department of the Buddhist Churches of America. "As soon as I could sit on a piano stool, I was given piano lessons. My teacher was a strict, elderly Englishman who came once a week." Motivated by her genetic and environmental influences, Helen's interest and progress in music blossomed. After attending elementary and secondary schools, she matriculated at the College of the Pacific (COP), Stockton, where her goal was a degree in music with a major in piano performance. In 1935 she married Minister Yoshio Iwanaga, who was then the religious leader of the Stockton Buddhist Church. Helen graduated from COP in 1936, gave private piano lessons and led choral groups in the church until 1940 when Minister Iwanaga was transferred to Watsonville. Classical Western music was Helen Iwanaga's great love. Yet, in order to capitalize on the interests of young Buddhists, mostly high school students, she organized the Watsonville YBA Orchestra (Young Buddhists Association). She purchased stock dance-band arrangements of the ’40s—Miller, Dorsey, Shaw. After many rehearsals, their ensemble work attracted the attention of YBA friends who invited them to play for dances. Their meager earnings from dance jobs provided more band arrangements, music stands and uniforms. 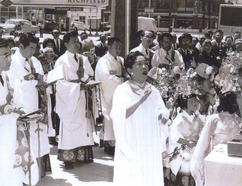 In postwar years, Iwanaga utilized her creative energies in promoting religious music in Buddhist churches. She wrote and arranged choral music; conducted choirs for special occasions. In all she devoted fifty years of music education to the Buddhist Churches of America. She enjoys a personal sense of accomplishment today from that experience. “I love to sing, I go to the opera, I love symphonic music!” exclaimed an energetic, youthful, Helen Iwanaga as she approached her mid-80s. Reverend Yoshio Iwanaga, a Buddhist missionary reverend, dance teacher and choreographer came to the United States in 1930 to teach Doyo Buyo and bon odori to the Nisei members of the Buddhist Mission of North America. He taught and produced children’s dance recitals for twenty years at Buddhist temples throughout California, Oregon, Washington and Western Canada, He also expanded the Japanese American observance of Obon in California to include bon odori, the dance component of Obon in Japan which had rarely been performed on the Pacific Coast of the United States before Reverend Iwanaga’s arrival. Mrs. Helen Chizuko Iwanaga was “his first vocal and piano accompanist . . .” Five years after their first meeting they were married and they were later named the first heads of the Music Department of the Buddhist Churches of America. He did not mix Western dance movements with his Japanese Doyo Buyo choreography, although he did choreograph improvisational, modern dance pieces to Doyo music. “Doyo are children’s songs first written during the Taisho Period (1912- 1926) in a western song style by Japanese musicians and poets. In 1940 he was made Reverend of his own Temple in Watsonville. In that same year he was “asked to organize a Buddhist Day as part of the fair commemorating the Golden Gate bridge. 97,000 people came to the Fair, 25,000 were Japanese Americans. The parade included marching bands, and 1,000 dancers gathered to perform bon odori. 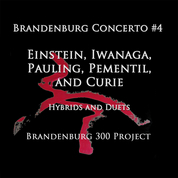 Mrs. Iwanaga said,”it was really, really thrilling and I thought, my gosh, this is it. In 1948, 1,000 dancers performed bon odori in the plaza of the San Francisco Civic Center. 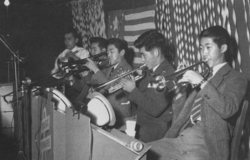 It was the first major event of the Japanese American community after WWII. In other words, Reverend and Mrs. Iwanaga brought to America, American music that had been modified in a classical and deliberate way to meet educational and social needs in Japan. They also loved a broad range of music, and Reverend Iwanaga listed “World Music” as one of his hobbies (along with baseball, football, tennis and bonsai). He once chorographed a dance where the children wore baseball uniforms to “Coming through the Rye.” During this period Taiko was also evolving and starting to incorporate “African, Balinese, Brazilian, Latin, and jazz, bridging many styles, while still resonating with the Asian soul in America.” Meanwhile, walking down the street in Salinas’ Chinatown one would hear Japanese, Chinese, Filipino, Mexican, Jazz, Blues, Classical, Country, Cowboy, Bakersfield sound, Nashville, Memphis even proto-rock and roll. This cross-cultural fertilization suggests a rich tableau for the ear. The hysteria of the time following Pearl Harbor eventually led to the Japanese Americans of the Salinas area being imprisoned in the Salinas Fairgrounds and then transported some months later to the Poston Internment Center in Arizona. Reverend and Mrs. Iwanaga were interned at Poston Camp #2. The 2004 Reunion Book counts 18,422 total population for all three Poston Camps, with 9483 in Camp I, 5952 in Camp II and 2987 in Camp III. The Camps opened between May and August of 1942. The peak population was on April 14, 1943. 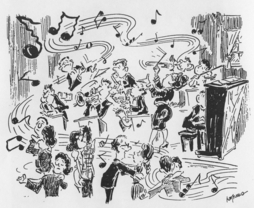 To keep spirits up, a children's choir and other musical activities, including several swing bands, were formed. Used to the mild weather of Salinas, they are hit with the extreme heat of southern Arizona. Many had brought heavy clothes -- having been told they were going north to a cold location. They are scared, bewildered, frightened. Great Americans suffering a great wrong. As they arrive teenage Japanese-American musicians who formed jazz bands at the Salinas Fairgrounds - many from Watsonville where Reverend Yoshio and Mrs. Helen Iwanaga were based -- greet the new prisoners with jazz -- Glenn Miller, of course, but also Duke Ellington, Benny Goodman, Louis Armstrong and the other jazz giants of the era. Some of the instruments were provided by the Mormon Church, some of the music by the Hollywood Musician's Union, and some had purchased zoot suits from tailors in Los Angeles. It had to be an extraordinary moment, and it was often repeated with each new set of prisoners rolling through the gates. 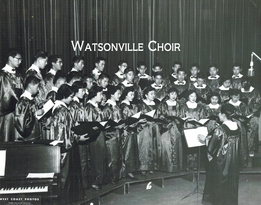 Reverend Iwanaga’s wife, Helen Chizu Iwanaga, earned a bachelorʼs degree in music from UOP, taught piano, lead the church choir, and formed a swing band before WWII at the Watsonville Buddhist Temple. I wasn't in the band, I was her piano student. I didn't play any Japanese numbers, though, I had traditional, classical, all the classical but I did play Rhapsody in Blue. . . . . Betsy (Waki) Tatsugawa recently visited JAMsj. 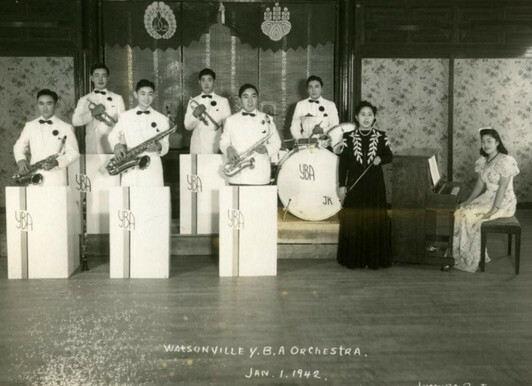 Her brother, Terry, played in Helen Iwanaga's Watsonville YBA Orchestra before, during, and after WWII. Betsy has been a Salinas resident since marriage. Reiko (Akahoshi) Iwanaga’s late husband, Mutsu "Gordon" Iwanaga played in his mother’s orchestra. He also sang in a Watsonville men's quartette, the Monotones. My brother-in-law and Mutsu’s best friend, Akio Idemoto, was also a member of the quartette. Akio still resides in Watsonville. Aggie also remembers that Mrs. Iwanaga wrote her own music in camp. The dance form called Bon Odori first appears in the literature of the 15th century.” By 1600 Bon Odori was widespread and very popular. “Bon Odori was an extremely popular festival in the rural communities of Japan before the Meiji Period. Usually held on or near the 15th day of the seventh lunar month, it was a welcome break from the rigors of farm-life. In fact, it was one of two times during the year that peasants and farmers in particular were permitted by their samurai overlords to take a holiday. The other holiday was the New Year celebrations of Oshigatsu. Obon was also a time when young people could meet and socialize freely, especially during the Bon Odori. The dance was often an all-night affair which saw the relaxing of the normal rules of propriety. In the Meiji Period (1868-1912) the Bon Odori was banned as it was thought to encourage immoral behavior, especially among the unmarried young who were permitted to fraternize unchaperoned during the period of the Bon Odori. The ban came at a time when the Meiji government was desirous of showing the western world that it was as civilized and advanced as any country in Europe, albeit basing that definition of civilized on western standards. It was a period of intensive copying of western clothes, habits, and mores. An inordinate number of babies were in fact born nine months after the Bon Odori during the Tokugawa period and the Japanese designation of October as the wedding month may possibly derive from the necessity for an expedient marriage before pregnancy became too obvious. Because of the ban however, much of Bon Odori music and dance was lost.